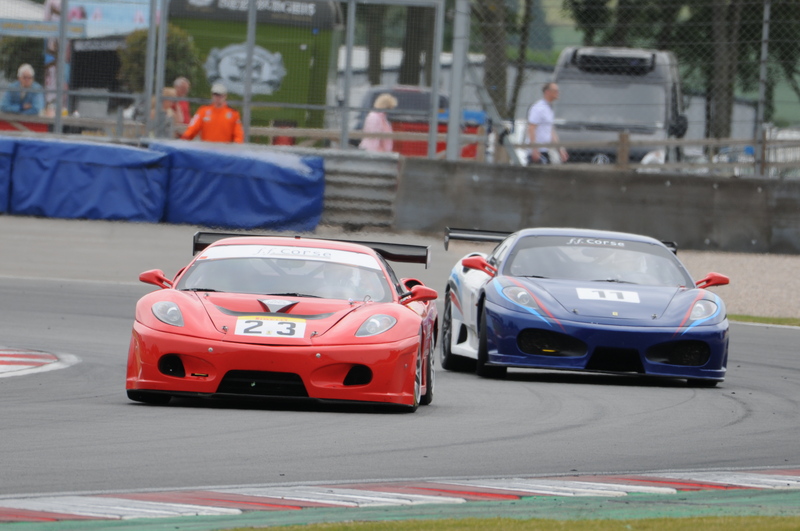 Modern Challenge cars - good to have ..
Ferrari Club racing in the UK has a long and honourable history. 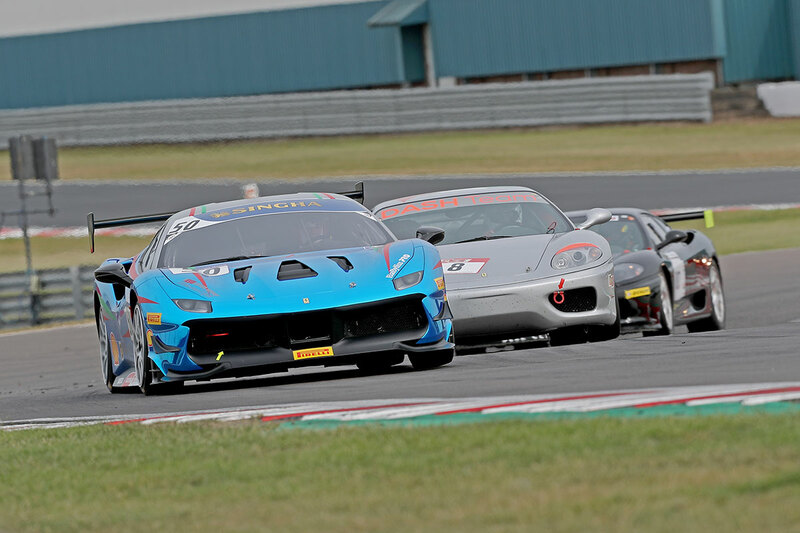 There were one-off races back in the ’80’s when full fields of mostly road-going Ferraris lined up to great spectator interest, and in 1986 this was formalised into a proper race series. 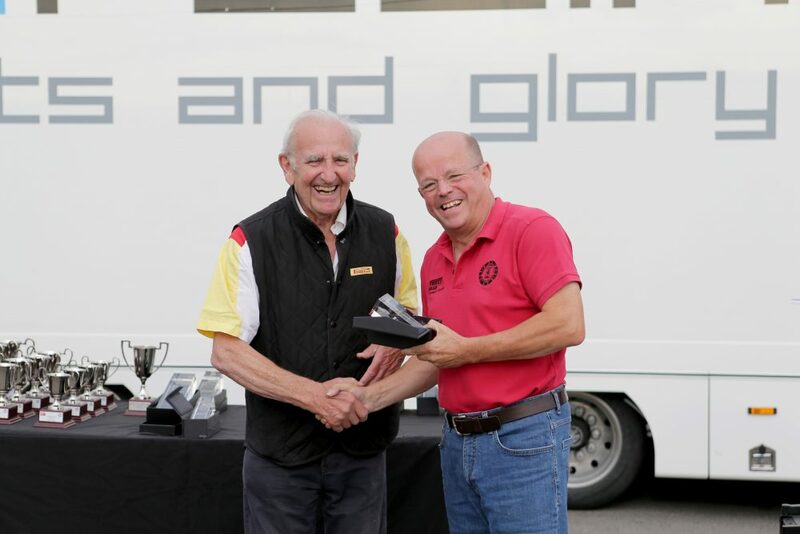 The first race of the new series at Mallory Park was won by Tony Worswick in his rally-prepared 308GTB, and things took off after that. Over the years there were some regulation changes to cater for the more modern Ferraris that kept coming along, but in 2003 the older cars were given their own series which has since then been known as the ‘formula classic’ series. The newer cars, increasingly Challenge-spec cars as delivered by the Factory, continued in a separate series but after some successful years began to run into trouble with grid sizes as the sheer cost of running these more complex cars began to bite people’s pockets. 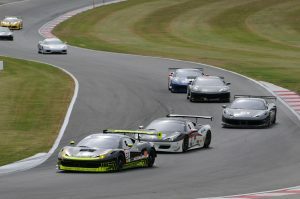 There were also higher-profile series’ available, such as GT Cup, Britcar and British GT, and the Ferrari-only ‘Open’ Series was folded at the end of 2014. 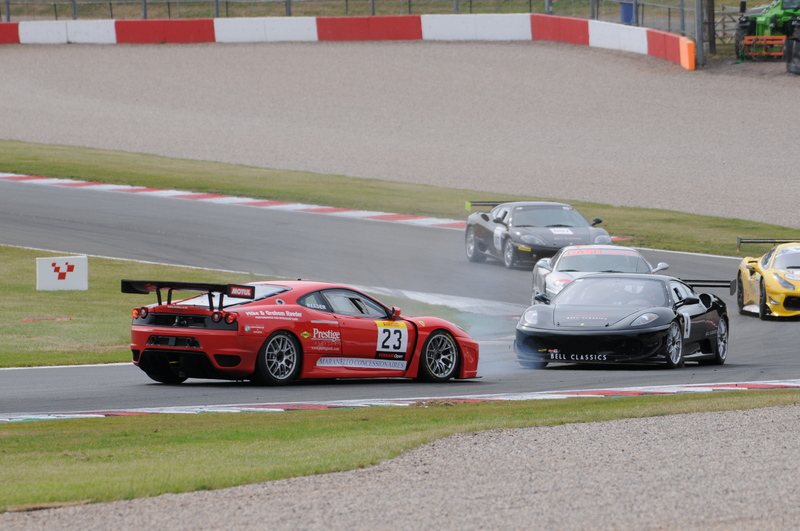 Suddenly, for the average Club member, there was nowhere to go with their Challenge-spec cars. 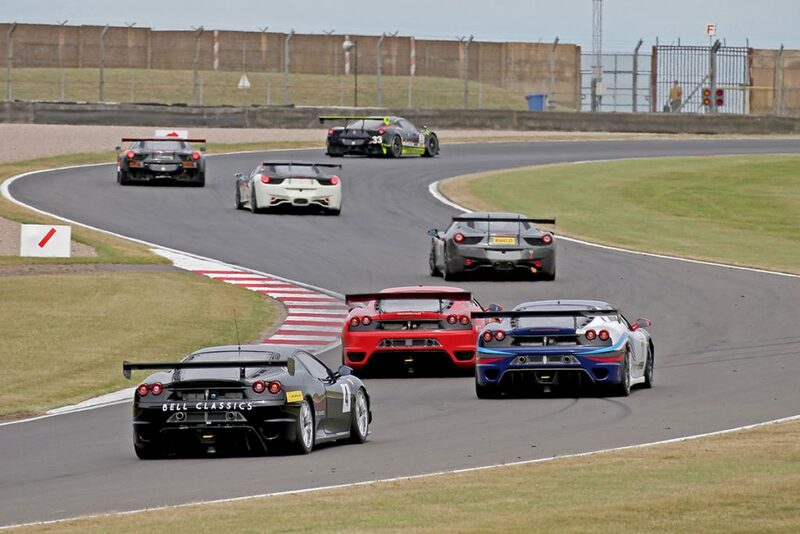 They all seemed to disappear into a certain facility at Silverstone and were only brought out for the occasional track day. 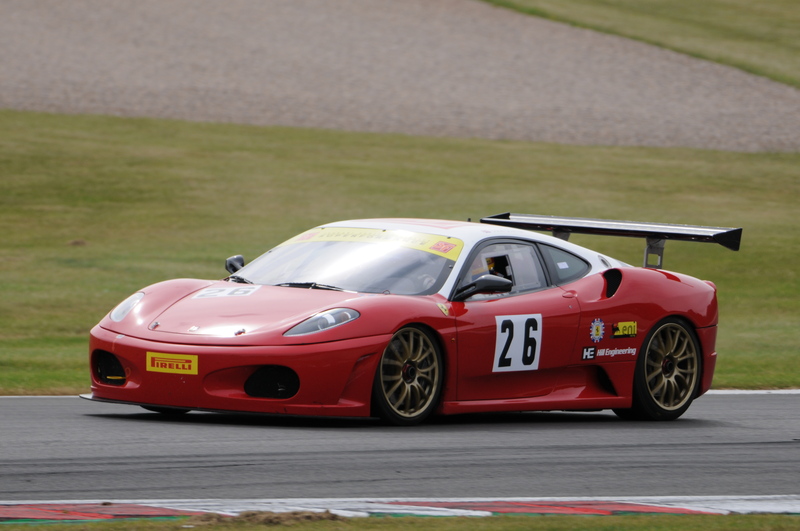 In the last couple of years interest across Europe has been increasing for these fabulous factory race cars. 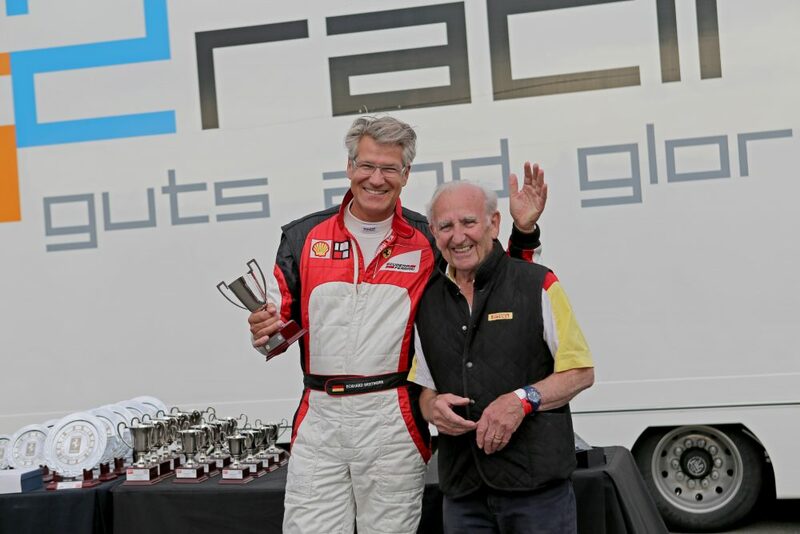 The German FOC three-race series held in 2017 and the Challenge & GT Days event at the Red Bull Ring Austria in May this year being evidence of this. The German FOC head Ben Doerrenberg was contacted to see if a joint series could be organised with the UK. 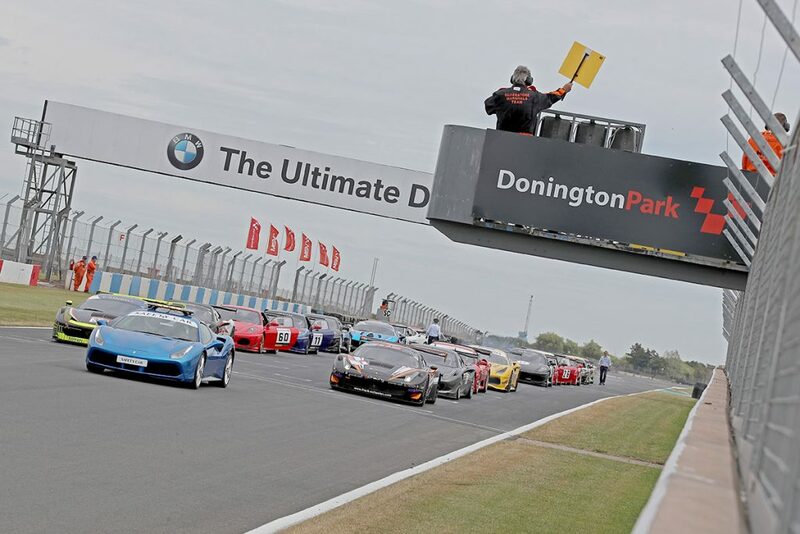 The two races at Donington were the first fruits of that co-operation. 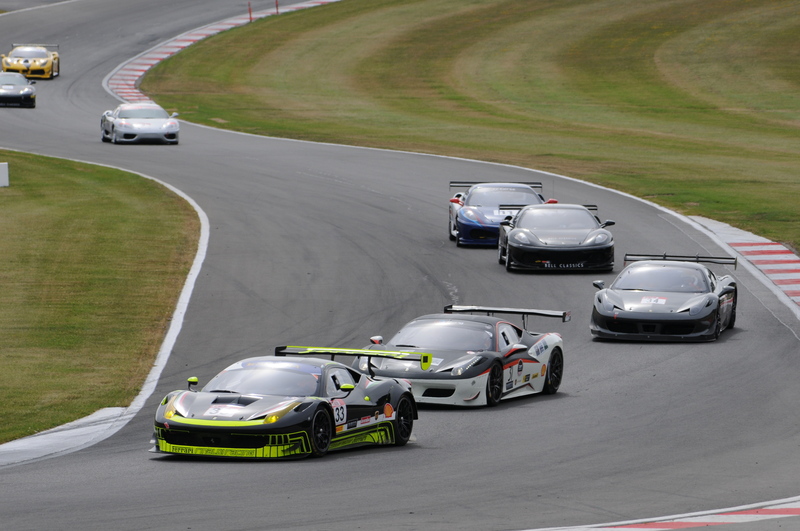 It is hoped that in future the Ferrari Clubs in The Netherlands, France and Scandinavia could also be brought onboard for an international series of races for Challenge-and GT3-spec cars, up to and including the 458 models. The newer 488s would be looked after by the Factory and importer-run series’. 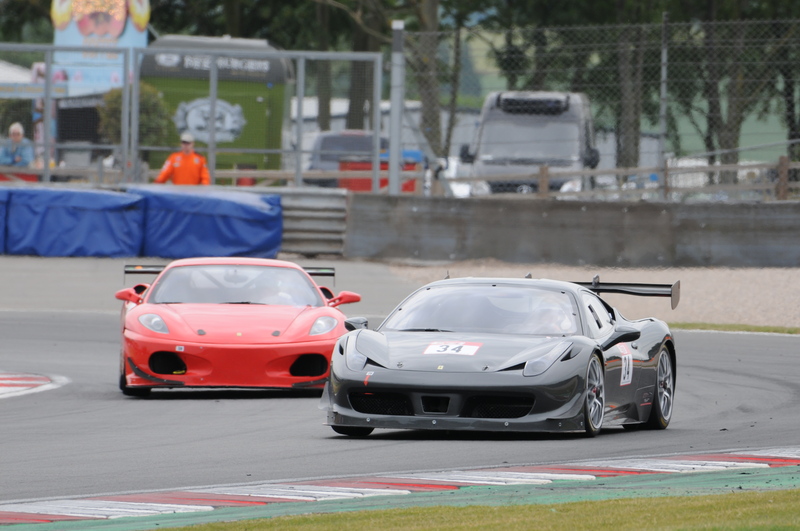 A fine entry of 22 Ferraris turned up for first practice at 9 in the morning, ranging from a couple of 488 Challenges (a bit of artistic license with eligibility there), three GT3 cars, and a host of 458s, 430s and 360s, all in Challenge spec. 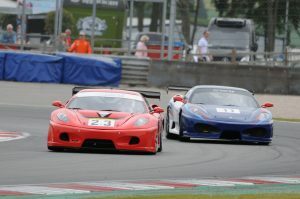 Ten of them had come over from Germany and the most potent looked to be the two 458 GT3s of Frank Scheelan and Eckhard Breitmaier. 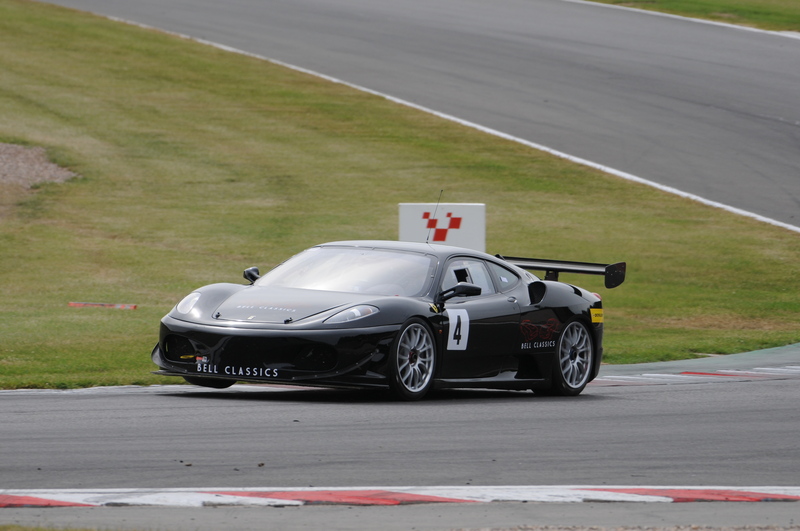 Our own Gary Culver (458/Ch) looked to be the quickest UK runner, but much was also expected from Wayne Marrs (430/Ch) and Graham Reeder (430 GT3). 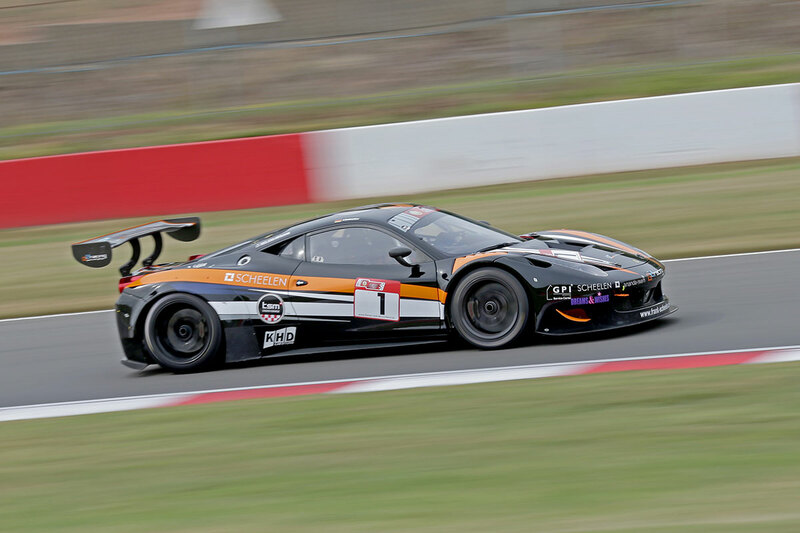 The practice session showed that the German guests still had a bit of circuit-learning to do, with Culver, Marrs and Reeder ahead of the two leading German GT3s. 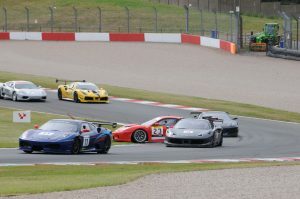 However qualifying at 11.30 already showed a different picture, with Breitmeier and Scheelan some 3 seconds quicker than in their first experience of Donington to head the front row of the grid for the first of the two races, with fellow German Marc Waecher (458/Ch) third and Culver fourth. Marrs pulled out a terrific time of 1.10.763 in his 430 Challenge for fifth spot ahead of Reeder and Tony Jones (430/Ch). 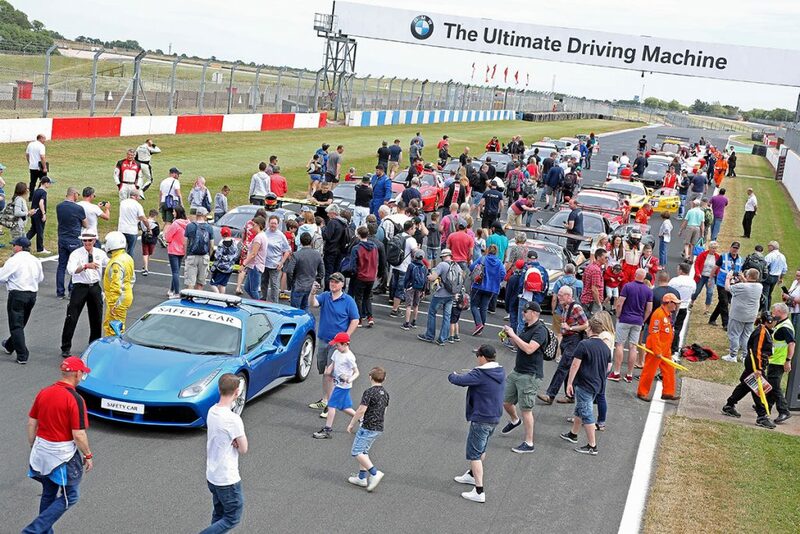 The grid for race 1 formed up in dry, warm but overcast conditions, but not until confusion about grid positions was sorted out with a lot of pushing and shoving cars into their correct slots. 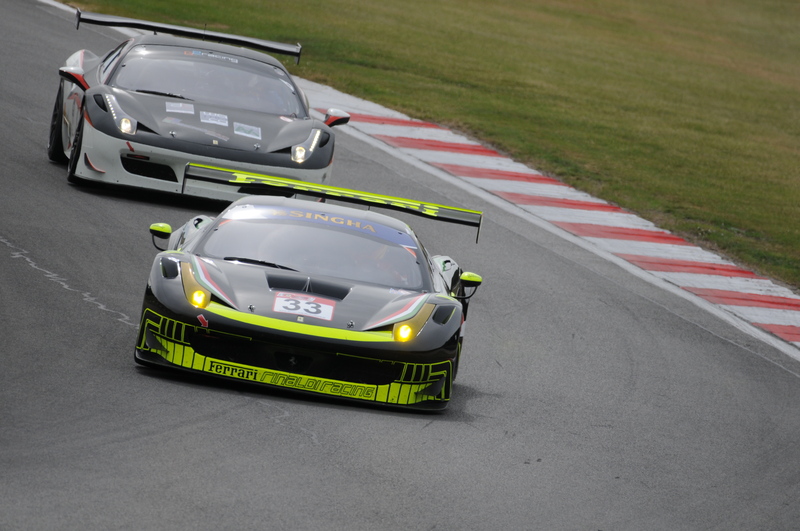 It was a rolling start so they set off after the pace car for the formation lap and when the field was released for their 30 minute race it was pole-sitter Breitmeier in his 458 GT3 who lead through Redgate closely followed by Scheelan, Waecher and Culver, with Reeder next. At first Breitmeier pulled out a good lead and seemed to be disappearing into the distance, but within a few laps Schellan and Waecher closed up to him, with a gap behind to Culver who had Wayne Marrs on his tail. 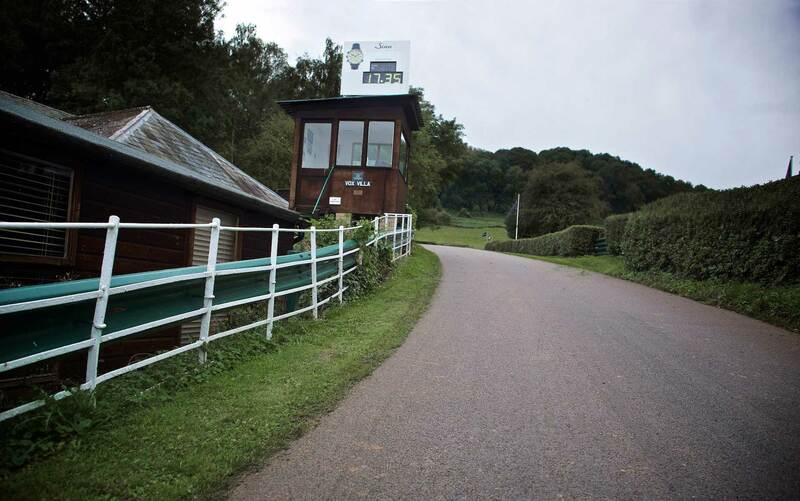 On lap 9 Scheelan closed right up to the leader and in a confident manoeuvre at Redgate passed him for the lead. But a lap later is was all reversed again and for the next five laps they remained nose -to-tail until Schellan finally got in front again and just kept the lead whilst Breitmeier spun and went back to 5th. This put Waecher up into second but some 15secs behind now. Whilst all this hectic stuff was going on at the front Culver and Marrs were running 4th and 5th, close together, and this became 3rd and 4th after Breitmeier spun. 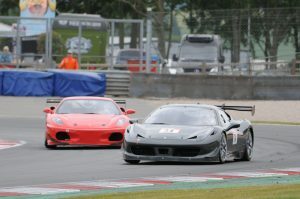 The German’s 458 GT3 then began a determined catch-up drive, passing Marrs with ease after the latter’s car suffered from a loose undertray, and then closing up to Culver but missing out on third spot by two seconds. Scheelan finally crossed the finish line some 15secs ahead of Waecher but he had Culver just half a second behind, with Breitmeier and Marrs rounding out the top five. 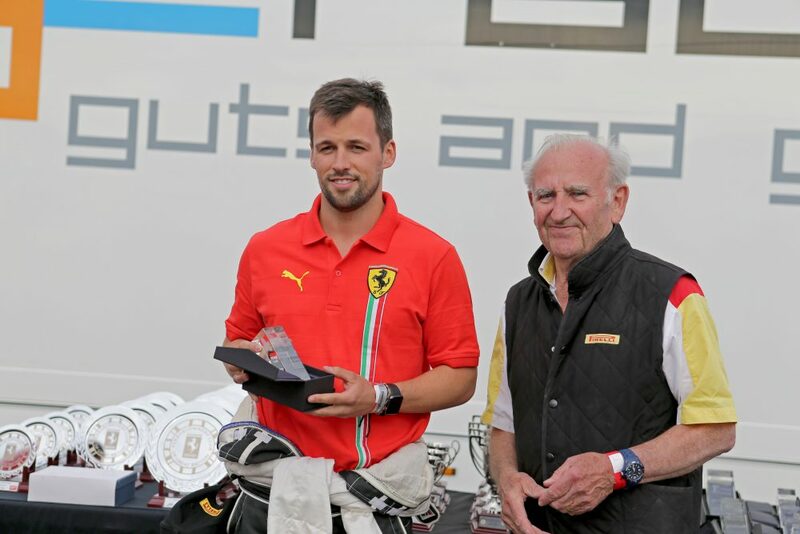 Reeder had a quiet race into 6th place and Ferrari Club Germany president Ben Doerrenberg finished 7th in his 488 Challenge. 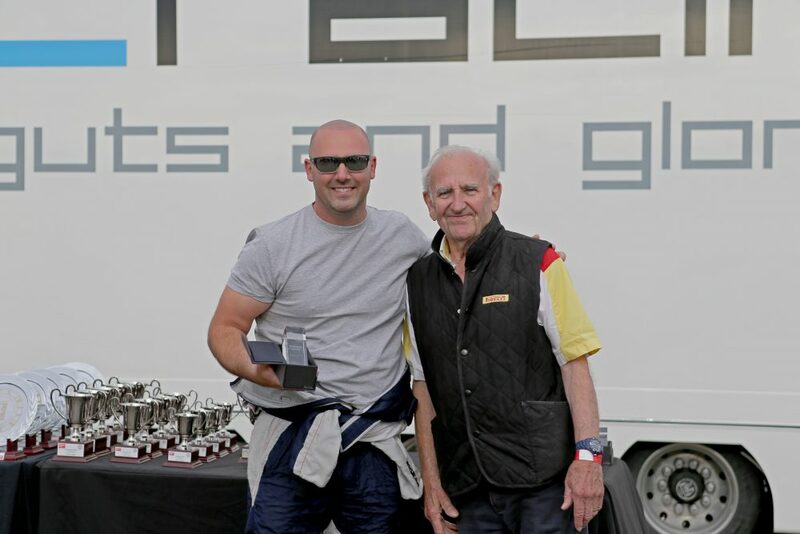 Best of the 360 Challenge cars was Dennis Gross who finished 8th overall, with our own Paul Ugo in 12th spot in the second of the 360s. 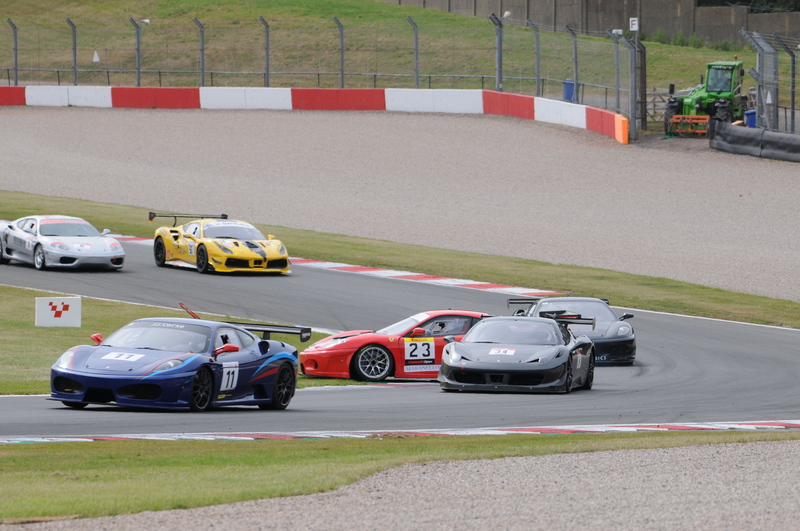 The second race, again of 30 mins duration, formed up just after 4pm in still very warm conditions. 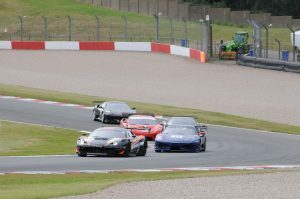 Gird places were decided by the second-quickest qualifying times so it was a very similar picture to race 1, with Breitmeier in pole followed by Scheelan, Waecher and Culver. 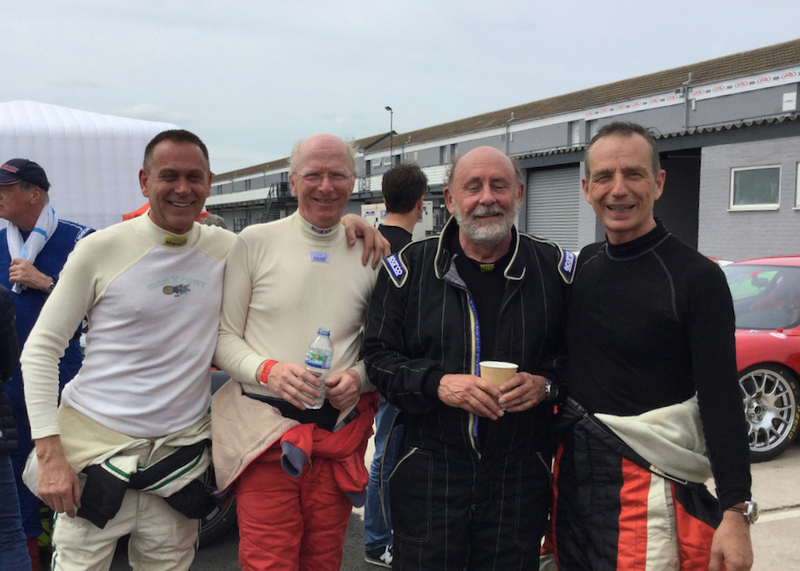 The three 430s of Marrs, Reeder and Tony Jones were lurking just behind, with Doerrenberg in 7th spot. 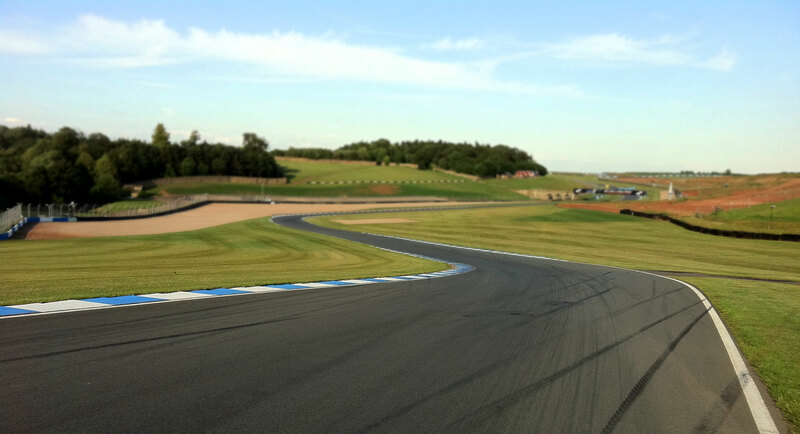 The start itself was clean but down the Craner Curves it all started going wrong. Depends who you talked to afterwards, but it seems that Reeder and Culver went for the same piece of tarmac at the Old Hairpin, hit each other and punted Reeder’s 430 off the track. In a chain reaction more chaos unfolded as Rob Macfarlane (360/Ch) was hit heavily by Wayne Marrs, putting them into retirement with irreparable damage. The safety car immediately came out and picked up the leader Breitmeier who was followed by Waecher and Scheelan. 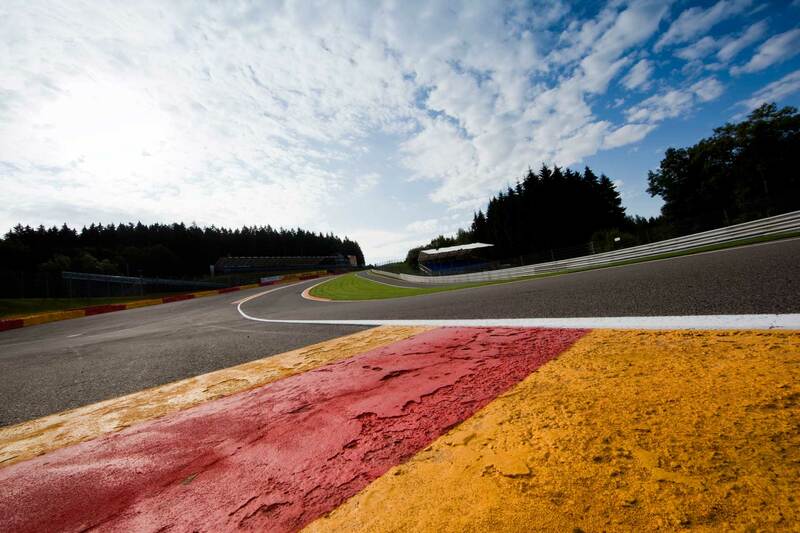 For the first four laps they circulated slowly behind the SC until racing resumed on lap 5. 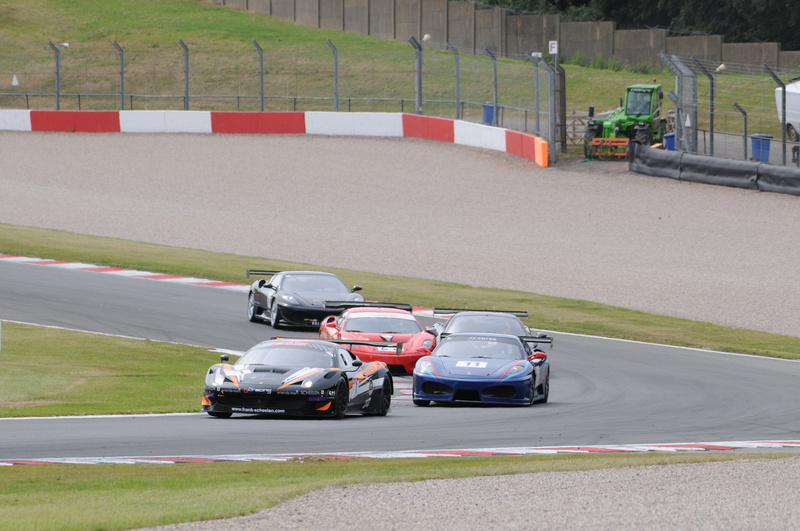 Macfarlane and Marrs had obviously retired but Culver was still up in 4th place whilst Reeder managed to get his stalled 430 GT3 going again and joined the back of the field. The first four took off at the front of the field in close formation, and the order quickly changed with first Waecher taking the lead and then, on lap 6, Schellan hit the front closely followed by Breitmeier with Waecher slotting into 3rd just ahead of Culver. 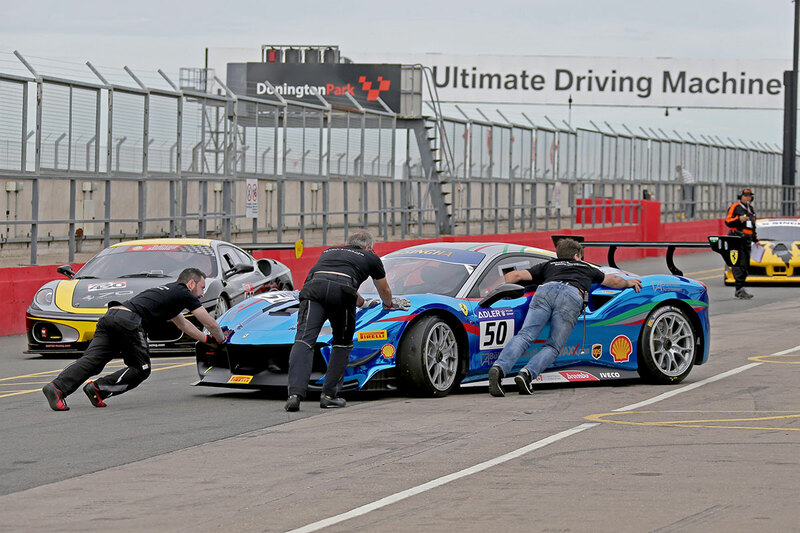 Like in the first race tyre management seemed to come in to the equation, with particularly the 458s squirming under heavy braking and understeering. Culver seemed to contend with this better than the other front runners and on lap 13 he went ahead of Waecher who was noticeably troubled with lack of grip. 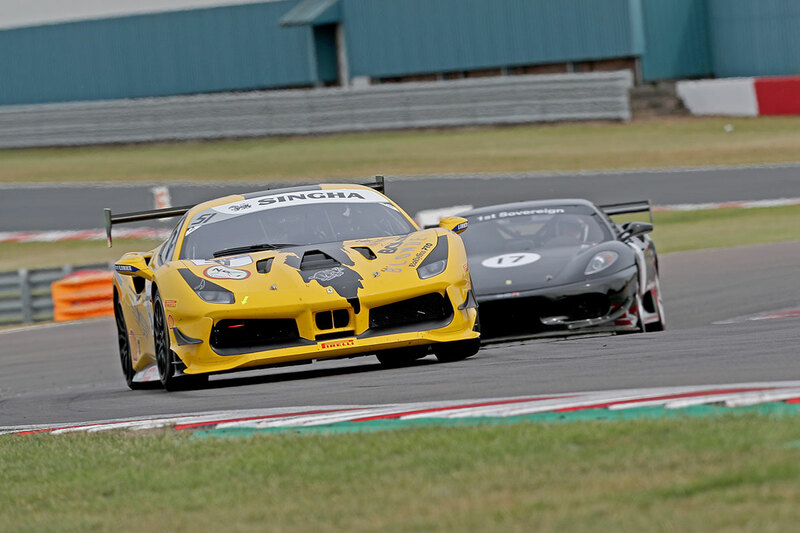 The top three ran closely together for the remaining laps, and a second covered them at the finish, with Waecher a distant 4th. Tony Jones was top 430 runner in an excellent 5th place but behind him was a frantic scrap involving the 488 of Doerrenberg, the 430 of Nicky Paul-Barron and misfiring 430 of Andy Christopher, with Reeder catching them all after his first lap mishap. Alas, Reeder had a spin on lap 13 and dropped back, leaving Doerrenberg to narrowly scrape home in 6th place in front of NP-B with Christopher just a second behind. 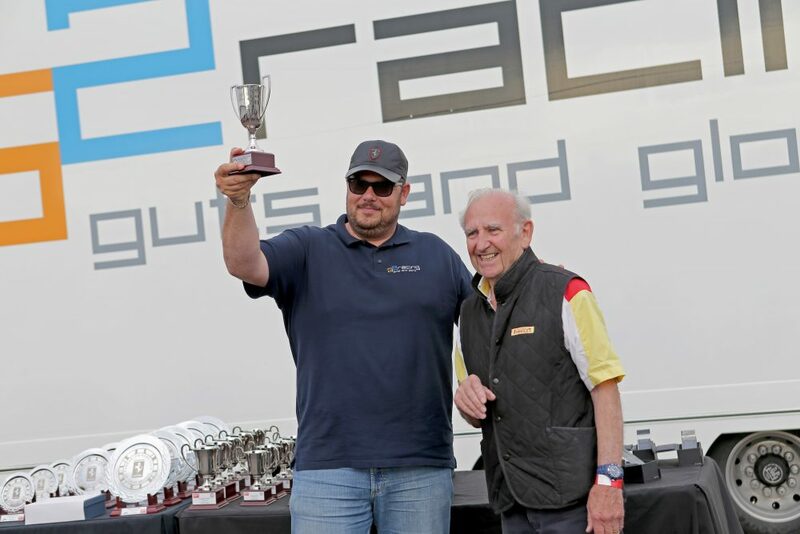 Top 360 this time was Eddie Cowen who had taken over the car which Matt Wilton had driven in the first race – race 1 class winner Dennis Gross had to be content with second place but the two of them were just seconds apart throughout the race and frequently traded places. 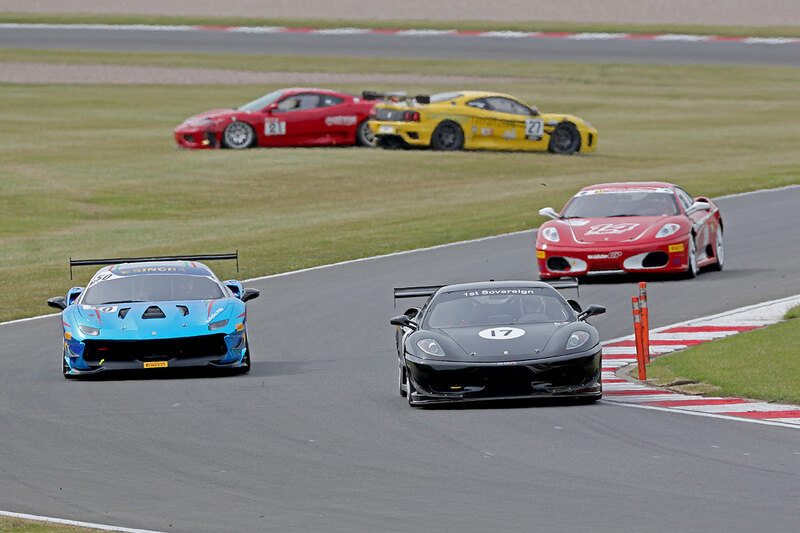 An excellent race throughout the field! 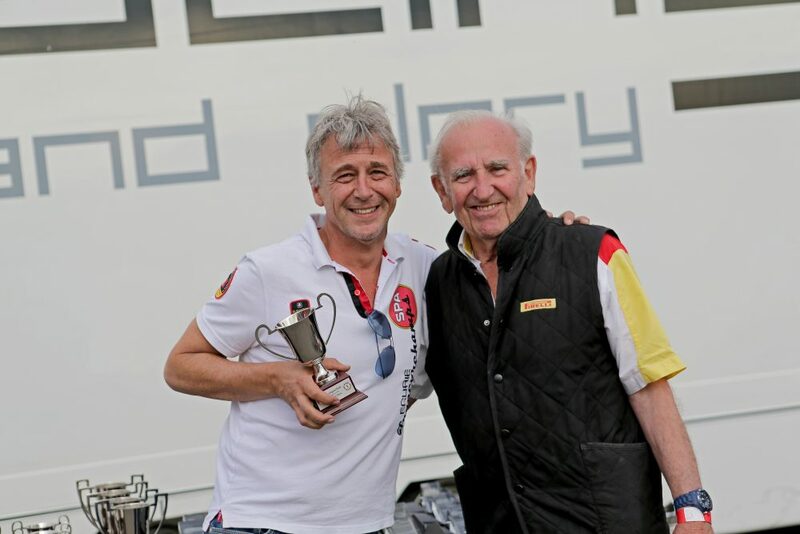 After all this hectic activity, not to forget the two Pirelli Ferrari formula classic races as well as the track day activities, a large crowd gathered at the nearby Priests House Hotel for a hog roast and a few glasses of wine and some music. 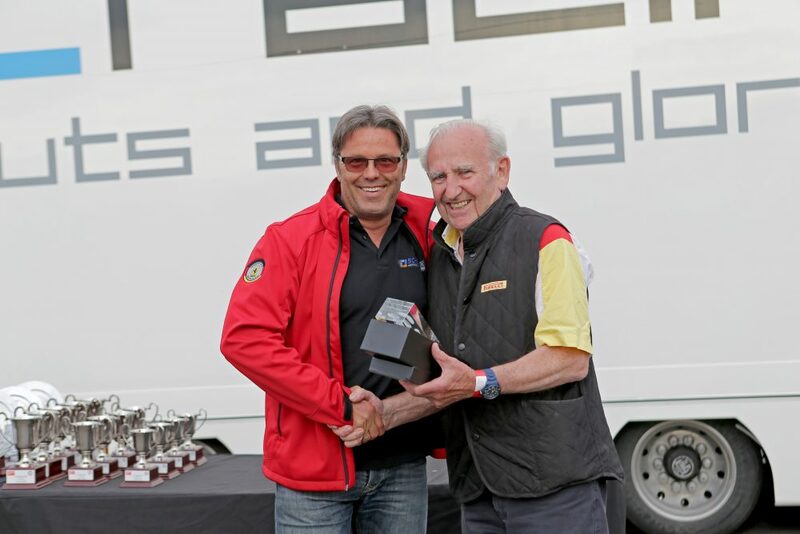 Our German guests held a charming speech thanking the hosts from the UK club and each visiting driver was presented with a memento from the FOC to commemorate their trip to Donington. 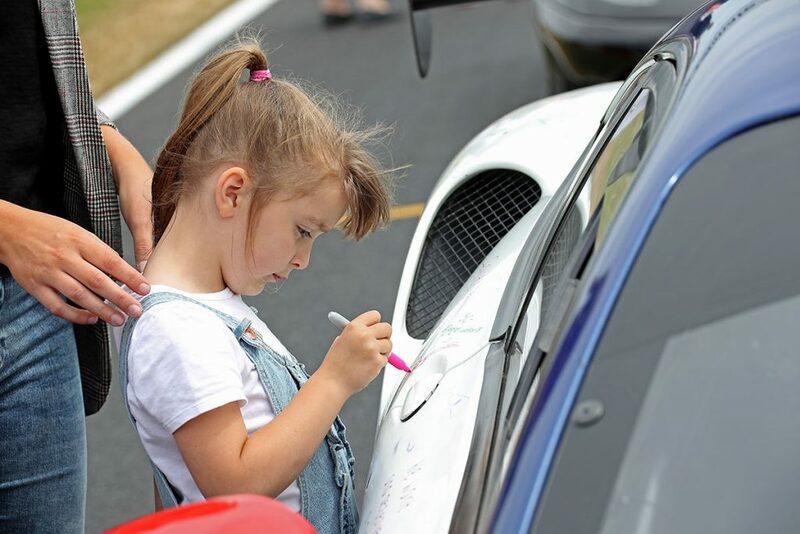 It is hoped that this initial race will be a precursor to more of the same, and following the success of this event it has been announced that a further two races will take place on 19th August at the Brands Hatch Festival Italia.